FITTING TRIBUTE TO A NATIONAL HERO. 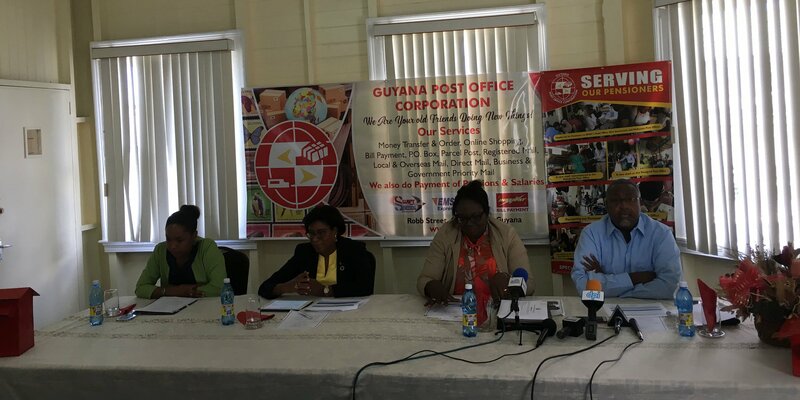 From left are Guyana Post Office Corporation (GPOC) Public Relations Officer Telesha Whyte, Minister of Public Telecommunications Cathy Hughes, Postmaster General Karen Brown and Chairman of the GPOC Board Raphael Massiah yesterday at the GPOC’s annual press conference. Minister of Public Telecommunications Cathy Hughes announced yesterday that the Guyana Post Office Corporation (GPOC) will be issuing a commemorative stamp to celebrate the 100th anniversary of the birth of late President Cheddi Jagan. Speaking at the GPOC’s annual press conference, Hughes said the corporation recently entered an agreement with the Cheddi Jagan Research Centre to produce a stamp to commemorate the 100th birth anniversary of the late president, who was born on March 22nd, 1918. She said that the stamp is being produced and designed by the Inter-Governmental Philatelic Corporation (IGPC), which is located in New Jersey. The company, she noted, has a “longstanding” relationship with the GPOC and has produced many of the stamps that have been used over the years…..
SN subscriber Django, please post full report. Thanks in advance. GPOC to issue commemorative stamp to mark Cheddi Jagan’s 100th birthday. She said that the stamp is being produced and designed by the Inter-Governmental Philatelic Corporation (IGPC), which is located in New Jersey. The company, she noted, has a “longstanding” relationship with the GPOC and has produced many of the stamps that have been used over the years. “This special Cheddi Jagan commemorative stamp will be launched and unveiled and made available to the public in March as we celebrate this 100th birth anniversary and we look forward to the relationship with the Centre on this exciting project,” she said. Speaking on other plans for the year, Postmaster General Karen Brown explained that four post offices – New Amsterdam, Anna Regina, Wales and Bagotville – are slated for infrastructural works. They will be equipped with security systems, adequate Information and Communication Technology (ICT) systems, air conditioning systems, weather protection, seating accommodation and lavatories. The rehabilitation of the post offices is slated to cost some $30 million and will be done in three phases. “In embracing the government’s mandate, post offices will facilitate ICT hubs within our parameters, all of which will provide a conducive environment for engagement and setting the atmosphere for productivity,” Brown said, while adding that they have also been able to acquire the titles for lands in Bartica, New Amsterdam, Wismar, Charlestown and Anna Regina, which adds to their assets. Brown also noted that the GPOC plans to fully computerise all of its departments and will be acquiring suitable software to meet business needs. Out of the 65 odd post offices around the country, she indicated that only 54 of them are computerised. Brown said that they will also be improving their operations department, as one of their goals is to ensure that their operations incur a reduced cost. As a result, they will be reviewing a number of their internal procedures and will be implementing the Post Code, which is expected to aid in sorting mail and delivery. Brown added that also planned for 2018 is the completion of a security self-assessment tool to enable a security audit of the GPOC’s operations, thereby putting it in compliance with the Universal Postal Union (UPU) regulations. “We have also acquired an x-ray scanner through the UPU quality of service fund to aid the corporation to improve its efficiency,” Brown added, while stating that they will also focus on succession planning and review their appraisal system. Quite a fit and proper tribute to the Father of the Nation.